START/STOP button: Short press once to start up Log4, press and hold to turn off Log4.USB. When Log4 device is on with a micro SD card inserted, short press to start/stop logging data onto SD card. Menu button: Access Settings and Toggle back and forth between screens. Alarm lights will light up when voltage and/or current limit has been exceeded. Charge/ready turns red during charging if device battery is not full, turns green when fully charged. Terminal IN (+/-): Pin connection to the Power Supply. USB IN: Connects to the USB power supply (ie. PC/ USB Hub). USB OUT: Connects to the device that the user would like to measure (ie. Raspberry Pi, Arduino). Terminal OUT (+/-): Pin connection to the Power Supply. Tx/Rx Light: light up during serial communication. Monitor USB: Log4 Charging port and communication to PC. Serial Pin outs: Serial connection to external devices . Micro SD: Mirco SD card slot. Reset Button: Short press the button located inside the small hole on the left face of the Log4 device using a thin object, such as a push pin, to reset the device to default settings. Navigation button: This is in the form of a scroll wheel on the left side of the device Scroll up and down to slide between options, press inwards to select option. Tx/Rx: Transmitter and receiver indication light. Monitor USB: Charge Log4 device and exchange serial data between PC and Log4. Serial pins: used for serial communication with external monitoring devices. Power indicates the power PIN position. Top left shows the time. Beside the time there might be an “S” or “U” or “L” indicating the SD card status (when SD card is inserted). See 5 for more details. Middle of the screen shows measured current, voltage, power. Bottom left shows the battery status and sampling period. Bottom right shows the amount of measurements taking into calculating the average. There might also be a line “OUT OF RANGE” under the three measurements if measurements are out of range. Scroll navigation wheel up or down to see screen focusing on current, voltage or power measurements only. 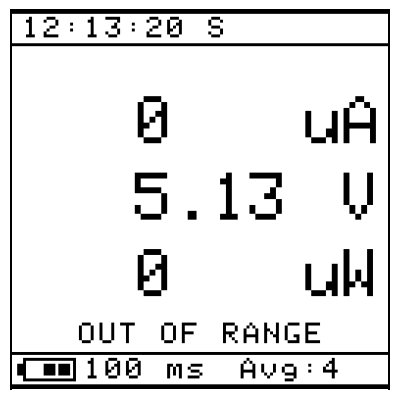 Instead of showing all three measurements at the same time, the screen now shows only the voltage, current or power measurements and their Maximum and Minimum measurements respectively (Fig. 14). This Log4 Device has an adjustable Sample Period between 1ms-60min (Fig. 15). Sample Period means how often the measurements are being taken. For example, 1s Sample Period means one sample taken every second. The default sampling period for the Log4 Analyser application display is 100ms. This number can be adjusted to accommodate different computer’s performance. However, if the sampling rate is too fast (<10ms), Log4 Analyser may slow down in measurements display. Press Menu button to enter Settings Screen. Press Navigation Wheel to enter Sample Period options. Scroll Navigation Wheel to choose Sample Period of interest. Press Navigation Wheel to select Sample Period, “Set!” will appear on screen to indicate the sample period is set. Under Sample Period options, press Navigation Wheel to select Custom. Scroll up and down to choose the desired sample period unit: ms, sec or min (Fig. 16). Press Navigation wheel to move to number selection, scroll up or down to change the number, then press navigation wheel to confirm each digit till the arrow pointing at SET, scroll up to finalise the custom Sample Period. If the Sample Period has been correctly set, it will be displayed at the bottom left of the screen (_updated_sample). Press Menu key two times to go back to home screen. To filter out short term fluctuations, a moving average filter is used to take the average value from M (measurements) and produce a single output. Higher M is generally used for faster sampling rates. For a given sampling period, higher M also produces more stable values on the Log4.USB screen. * Press Menu button to get to Setting Screen. * Scroll Navigation Wheel down to Display Averaging. * Press Navigation Wheel to enter Display Averaging options (Fig. 18). Scroll Navigation Wheel to choose option of interest. Press Navigation Wheel to select option of interest. If the Display Averaging has been correctly set, it will be displayed at the bottom right of the screen. This part of the settings allows for Invert Display and turning on Back Light. * Press Menu button to enter Setting Screen. * Scroll Navigation Wheel down to Display. * Press Navigation Wheel to enter Display (Fig. 19). Press Navigation Wheel to activate inverted display. Scroll Navigation Wheel down to Back Light. Scroll navigation wheel up or down to change the time in seconds. 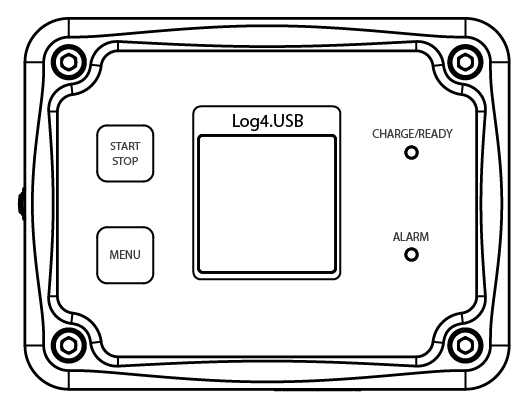 Two types of alarms are available on the Log4.USB - a visual indicator light and an alarm sound (Fig. 22). Both can be triggered by measurements (current, voltage or power) above or below the set threshold. Red alarm light indicates there are measurements above the high threshold. Blue alarm light indicates there are measurements below the low threshold. Purple alarm light indicates some of the measurements are above the high threshold and some of the measurements are below the low threshold. Using the above example (in Fig. 23), the Red Alarm light can be triggered if the High Current Threshold is set as 100mA. Press Menu for Settings page. Scroll Navigation Wheel to Alarm. Press Navigation Wheel inwards to select Alarm. Press Navigation Wheel to enable Visual Alarm. Scroll Navigation Wheel down to Chan A Current. Press Navigation Wheel to select Chan A Current. Scroll Navigation Wheel to High alarm En. Press Navigation Wheel to enable High alarm En. Scroll Navigation Wheel to High Threshold. Press Navigation Wheel to select High Threshold. Now the Alarm value setting page should be visible. Press Navigation Wheel to move from digit to digit. Scroll Navigation Wheel on the digit of interest, (in this case 100mA), Scroll the wheel until the number 1 is on the screen. Once the value has been chosen, repeatedly press the Navigation Wheel until SET is underlined. To finalise the selection, scroll Navigation wheel up or down once on SET. The Red Alarm Light will activate if the visual alarm is enabled and the alarm conditions are triggered. Using the above example (in Fig. 23), the Blue Alarm light can be triggered if the Low Voltage threshold is set as 6V. Scroll Navigation Wheel down to Chan A Voltage. Press Navigation Wheel to select Chan A Voltage. Scroll Navigation Wheel to Low alarm En. Press Navigation Wheel to enable Low alarm En. Scroll Navigation Wheel to Low Threshold. Press Navigation Wheel to select Low Threshold. Scroll Navigation Wheel on the digit of interest (in this case 6V), scroll the wheel until the number 6 is on the screen. The Blue Alarm Light will be activated if the visual alarm is enabled and the alarm conditions are triggered. Similar steps can be taken to set High and Low threshold for Current, Voltage and Power. Using the above example (in Fig. 23), the audio alarm can be triggered if the High Current Threshold is set as 100mA. Buzzing sound will be same for all types of alarms. A buzzing sound will be heard if the audio alarm is enabled and the alarm conditions are triggered. Turn ON Zero Cal to Zero measured currents and voltages (Fig. 27). Press menu button for Setting page. Scroll Navigation Wheel to Zero Cal. Press Navigation Wheel to turn on the Zero Cal, “Offset Applied” message will show on screen (Fig. 28). Press the Navigation Wheel again to confirm setting the offsets. Press the Navigation Wheel to turn off Zero Cal, “Offset Removed” message will show on screen (Fig. 29). Press the Navigation Wheel again to confirm removing the offsets. This page is a summary of the Log4 device information. For optimum performance make sure the device has the latest Firmware Version.